(CNN) -- A 4.5-magnitude earthquake struck Southern California on Tuesday evening, according to the U.S. Geological Survey. There were no immediate reports of damage or injuries. The quake was downgraded from an earlier magnitude of 5.1. 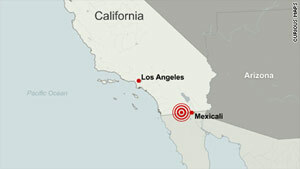 The temblor was centered 18 miles west-southwest of El Centro, California, just north of Mexicali in Mexico's Baja California, the USGS said. It struck at a depth of 6.3 miles. "This earthquake is within the aftershock zone of a magnitude 7.2 (earthquake) that occurred on April 4" near Mexicali, said Susan Potter of the USGS, adding "this is an area that was exposed to many large earthquakes in the past."